This has been a great series and the author continues to deliver. We met Avery in the first book when he helped Blake and Derek and we get to see him work through the loss of his bonded a few years before. Jameson is still in training but looks forward to having a ghostwalker to take care of. Avery hasn’t ghostwalked in years but he does when there is trouble and it puts Jameson in even closer proximity than their developing friendship has. Jameson will do anything to take care of Avery and has the understanding he needs. We get to see Avery and Jameson meet and boy do they get off on the wrong foot but Jameson wonderfully shows Avery he isn’t quite the jerk he came off as. Avery is so fragile in some ways but finds the strength to go after what he wants and needs. There are times he seems to jump ahead when he isn’t quite ready yet and I felt it just hurt Jameson when that happened. Jameson is about the most understanding person alive that it didn’t seem reasonable. I really liked the story but it seemed Avery and Jameson were on are far ends of the scale for their personalities. I look forward to more books in this universe and hope that Tyler is the focus of the next book. The cover art by Aaron Anderson is great and it’s similar in style to the others in the series and also gives a wonderful visual of Avery. This entry was posted in Book Reviews, Books, Dreamspinner Press, eBooks, Fantasy, LGBTQ Book Reviews, M/M Book Reviews, M/M Fiction, M/M Paranormal Fiction, M/M Romance, M/M Supernatural Fiction and tagged A Dreamspun Beyond Title from Dreamspinner Press, An Alisa Highly Recommended Story and Series, An Alisa Release Day Review: Somebody to Die For (Requiem Inc. #3) by Kris T. Bethke, author Kris T. Bethke, Requiem Inc series by Kris T. Bethke, Somebody to Die For (Requiem Inc. #3) by Kris T. Bethke. As with all the stories I have read by this author, I really enjoyed this one and I was hooked from the beginning. Julian has pretty much been reject by most of his family and doesn’t have a great history with relationships so he is very cautious about getting involved with someone. Wes is more than a simple investigator that he seems and is adorably sweet. We saw the story from Julian’s point of view so it made it easy to see his emotions and feelings. Wes is extraordinarily patient and will do anything to keep Julian safe and find out what’s wrong. They were able to fix Julian’s problem but there is still the mystery of who did it hanging out there. I really hope that there is another book in this world that will help solve that. The cover art by Written Ink Designs is great and gives a perfect visual of Julian. 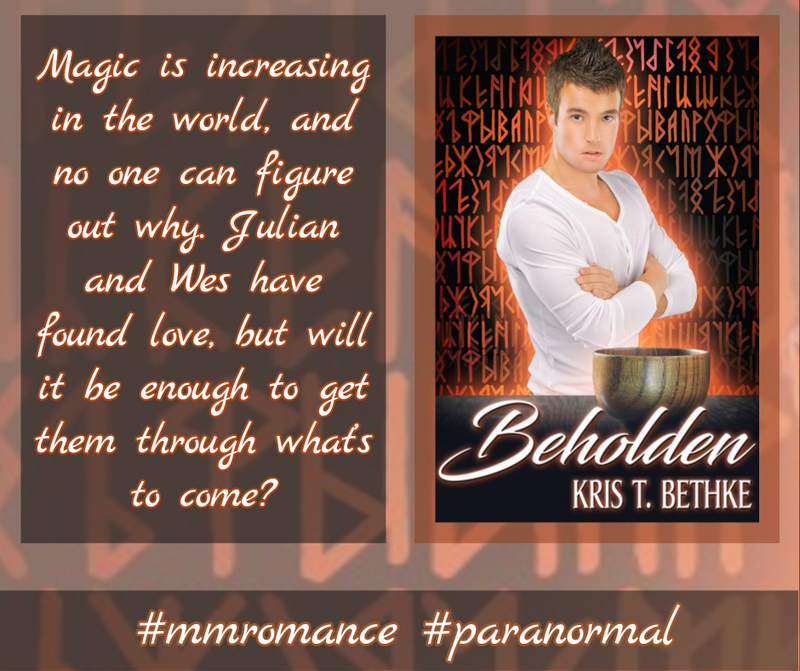 This entry was posted in Book Reviews, Books, eBooks, LGBTQ Book Reviews, M/M Book Reviews, M/M Fiction, M/M Paranormal Fiction, M/M Romance, M/M Supernatural Fiction and tagged An Alisa Review : Beholden by Kris T Bethke, author Kris T. Bethke, Beholden by Kris T Bethke, JMS Books LLC. I have been excited to read about Sam and Michael since I read the last book and it didn’t disappoint. Sam has been pining for Michael since they first met ten years ago but Michael finally crosses a line and Sam decides to take the step to separate them. That’s just the step that pushes Michael to actually talk to Sam about his feelings and see that future may be possible for them. Michael continues to break Sam’s heart every time he denies their connection but it’s just that unfortunate thing to finally push Sam too far and for Michael to open his eyes. Michael needs to take care of Sam and even with good intentions it bleeds into their work life. There is a solution coming but will it be too much of a sacrifice for one of them to make? We don’t get to see how these two have interacted in the past but seeing them in the previous book helps with that along with seeing both of their points of view. I loved seeing Sam find the support he has always wanted from Michael which gives them both the type of connection they have longed for. Michael has been hesitant and has trouble not being able to take care of Sam in all ways and causes some tension when bringing Sam back to life. I see the next story is going to be about Avery who we got to know in the first story and can’t wait to see him find love again and see a potential for Tyler to be a focus in the future too. The cover art by Aaron Anderson is great and I love the visual of Sam how it follows the same style as the first book. This entry was posted in 5 star Rating, Book Reviews, Books, Dreamspinner Press, eBooks, LGBTQ Book Reviews, M/M Book Reviews, M/M Fiction, M/M Paranormal Fiction, M/M Romance, M/M Supernatural Fiction, Shifters, Weres and tagged A Dreamspun Beyond Title from Dreamspinner Press, An Alisa Highly Recommended Review, An Alisa Release Day Review: Lost Souls Found (Requiem Inc. #2) by Kris T. Bethke, author Kris T. Bethke, Lost Souls Found (Requiem Inc.#2) By Kris T. Bethke, Requiem Inc series by Kris T. Bethke. Scattered Thoughts and Rogue Words is happy to host Kris T. Bethke here today, talking about her latest release Lost Souls Found. Welcome, Kris. Hey there! I’m Kris T. Bethke, and I’ve stopped in today to bring you an exclusive excerpt of my new book, which releases tomorrow. Lost Souls Found is the second book in my Requiem Inc series. Thanks for taking a second to check it out! Sam didn’t say anything as he watched the anguish take over Michael’s face. It was the most emotion he’d ever seen from him, and he hated that Michael was so upset. But it was all on Michael. He’d put them in this situation. Sam cocked his head to the side and tried to find the words for the revelations he’d recently had. He’d had a lot of time to think since he left Michael’s office. The last came out like an accusation, but Sam didn’t care. He was tired—tired of hoping and hurting, pining and needing. Things could have been so good between them, but he was done. Michael’s shoulders slumped, and though Sam hated to see him defeated, he couldn’t just let it go. Silence. The only sound was the little bell on Cameron’s collar as he skirted the edge of the living room and shot up the stairs. Sam was sure he could feel the tension in the room, and Cameron never liked dealing with tension. Sam didn’t either, for that matter. But he couldn’t take off like a cat. This entry was posted in Book Reviews, Books, Dreamspinner Press, eBooks, LGBTQ Book Reviews, M/M Paranormal Fiction, M/M Romance, M/M Supernatural Fiction and tagged @kristbethke #newbookrelease #LostSoulsFound, author Kris T. Bethke, Dreamspun Beyond Title from Dreamspinner Press, Lost Souls Found (Requiem Inc.#2) By Kris T. Bethke, Requiem Inc series by Kris T. Bethke. 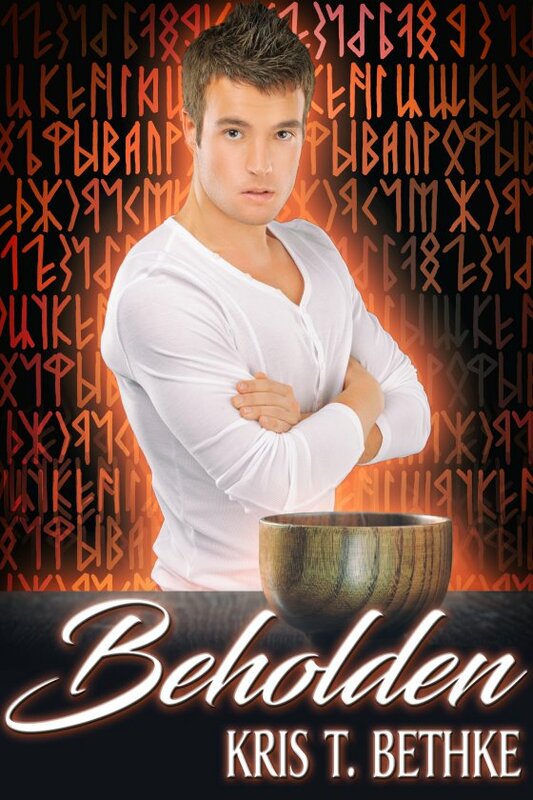 This entry was posted in Book Giveaways, Book Reviews, Book Tours and Contests, Books, eBooks, M/M Book Reviews, M/M Fiction, M/M Paranormal Fiction, M/M Romance, M/M Supernatural Fiction, Uncategorized and tagged @kristbethke #newbookrelease #Beholden #giveaway, author Kris T. Bethke, Beholden by Kris T Bethke, JMS Books LLC, Signal Boost Promotions. Hi everyone! First let me give Scattered Thoughts and Rogue Words a great big thank you for hosting my cover reveal. Thanks guys! I’m super excited to be here today to show off the beautiful cover for my upcoming release. Lost Souls Found comes out on April 17th, and it’s the next book in my Requiem Inc. series. When I wrote the first one, Ghost of a Chance, I didn’t know if I’d get the opportunity to write Sam and Michael’s story. But their relationship was important to the characters, so I wrote in Sam’s crush and some hints as to how Michael feels about him. So I was thrilled when Dreamspinner gave me the green light for Lost Souls Found because I got to bring their journey to love to the page. Their relationship isn’t the most easy one. They definitely both have some learning to do. But there’s no doubt they’ll get there in the end. And to showcase this story, Aaron Anderson worked his magic again and brought a gorgeous cover to life. The cover model is how I picture Sam, and he’s got a mischievous streak. Just look at that smirk! Aaron also did a great job mirroring the look of the first book, while making this cover wholly it’s own. As soon as I saw it, I knew it was the right one. You don’t have to have read Ghost of a Chance to understand Lost Souls found; they are both standalone. I recommend they be read in order so you can get a little background first, though it’s not strictly necessary. Either way, I hope you get a chance to pick up this book when it comes out. The author is giving away an ebook copy of the first book in the series, Ghost of a Chance. To enter to win, leave a comment about ghosts or the paranormal and your email address where you can be reached for Kris. Must be 18 years of age or older to enter. This entry was posted in Book Reviews, Books, Dreamspinner Press, eBooks, LGBTQ Book Reviews, M/M Book Reviews, M/M Fiction, M/M Paranormal Fiction, M/M Romance, M/M Supernatural Fiction and tagged @kristbethke @dreamspinners #CoverReveal #LostSoulsFound #giveaway, A Dreamspun Beyond Title from Dreamspinner Press, author Kris T. Bethke, Lost Souls Found (Requiem Inc.#2) By Kris T. Bethke, Requiem Inc series by Kris T. Bethke. Scattered Thoughts and Rogue Words is happy to host Kris T. Bethke on tour for her story Ghost of a Chance (Requiem Inc. #1). Welcome, Kris! Hi there! 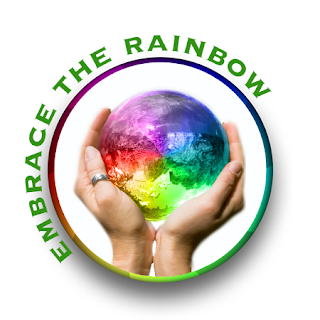 I’m Kris T. Bethke, and a great big thanks for spending a little time with me today. Thanks to the gang here at Scattered Thoughts and Rogue Words for hosting me! My newest release, Ghost of a Chance, is out now, and there’s a lot I love about this story. But the truth is, it almost didn’t happen. I’d started a version of this story several years ago and almost immediately shelved it, knowing it wasn’t working. But when I saw the submission call for this new line, I knew it was time to bring it out and dust it off again. The original premise wasn’t mine to begin with. It was, in fact, and idea my brother had. He told me about this idea a dozen or so years ago and it stuck with me. The picture he painted with that scene he shared with me haunted me for a decade. I thought about it off and on throughout the intervening years. And then I asked him if I could have it, because I wanted to write a story around it. So I started to, but as I said, it just wasn’t working. So I put it away and tried to forget about it. Except, just like the original idea, it wouldn’t leave me alone. When I decided to write trying writing it again, just about everything changed. Except the most important details. A man’s job requires him to die, he doesn’t want a new partner, and he helps lost souls cross over. Blake Jones emerged from the ashes of that failed first draft, and Derek Scott stepped in to pick up the pieces. Once I had these two MCs, everything else fell into place. That’s not to say this story wasn’t a lot of work. It was, but the most enjoyable kind. I needed to figure out the world, how it worked, and how these guys were going to fall in love while doing their job. Especially because the salient details weren’t something I’d ever seen before. I loved writing this story, and I loved creating the world in which they lived. The first try wasn’t right, but I’m so glad I didn’t give up on my instincts that this was a story that needed telling. If I’ve done my job, you’ll enjoy reading it just as much. I hope you get a chance to check it out. 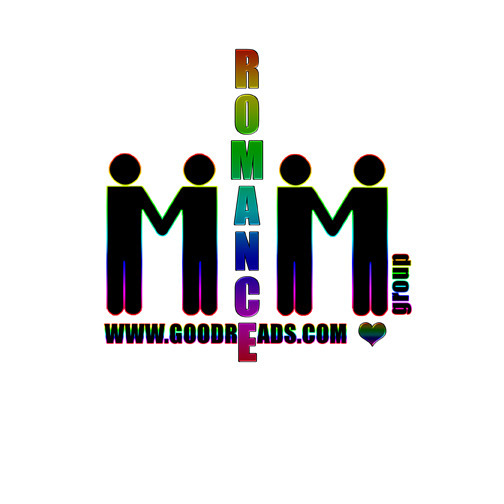 This entry was posted in Book Reviews, Books, Dreamspinner Press, eBooks, LGBTQ Book Reviews, M/M Book Reviews, M/M Fiction, M/M Paranormal Fiction, M/M Romance, M/M Supernatural Fiction, Uncategorized and tagged @kristbethke @dreamspinners #DreamspunBeyond #GhostofaChance #newbookrelease, A Dreamspinner Press Author Guest Tour, A Dreamspun Beyond Title from Dreamspinner Press, author Kris T. Bethke, Ghost of a Chance (Requiem Inc. #1) by Kris T. Bethke. I was deeply surprised by this short story, it’s the first I read by the author and I’m definitely going to check out her other works. Although I picked Hero Worship because I thought the blurb was interesting (I love these kind of stories, where the characters already know and are attracted from each other, but they wait for their right time or think their right time won’t come), what truly conquered me was the writing. In my opinion the author delivered an amazing story, the writing is very well done and engaging, it made the reading flow easily, it caught my attention and I read the story in one breath. Sure the short can’t give enough space to develop and discover more about the characters’ pasts or know more about their HEA, still it deeply satisfied me and it warmed my heart how well Alex and Matt fit together. If you’re looking for a quick reading, try Hero Worship by Kris T. Bethke, I’m sure you won’t be disappointed. The cover designed by Written Ink Designs is simple and clean but I’m not crazy about it. This entry was posted in Book Reviews, Books, Contemporary fiction, eBooks, LGBTQ Book Reviews, M/M Book Reviews, M/M Contemporary Fiction, M/M Fiction, M/M Romance and tagged A Stella Review: Hero Worship by Kris T. Bethke, author Kris T. Bethke, Hero Worship by Kris T. Bethke, JMS Books LLC. I absolutely loved this story. Blake is used to people leaving him, his only constant has been his brother and boss and fright from the get go he wants to see if Derek has it in him to stay. Derek is willing to take that bet from the start and exceed anyone’s expectations. Blake’s biggest fear is someone he loves leaving him, his parents kicked him and his brother out after they learned about the ghostwalker gene and all his lovers leave once they realize he is a ghostwalker. Derek has always wanted someone to take care of completely, he begins while they are sequestered but gets more of a chance to take care of Blake in every way as their relationship evolves. If only they were more informed about the anchor bond. Blake and Derek are wonderful. Blake finding the support and strength he so desperately needs in Derek and seeing him finally able to put aside his fears was perfect. Derek is so grounded and it’s in his nature to take care of others but he can tell from the beginning that it means more with Blake. I could feel both of these characters emotions throughout the whole story; Blake’s fear when he had a problem in the spirit realm and Derek’s when Blake came back to life to quickly are the biggest and made my heart stop for a second. This story is a great beginning to this new series and hope it continues. I really hope to see Blake’s brother, Sam, find the happiness he is looking for too. The cover art by Aaron Anderson is great and gives a wonderful visual of Blake. This entry was posted in 5 star Rating, Books, Dreamspinner Press, eBooks, LGBTQ Book Reviews, M/M Book Reviews, M/M Fiction, M/M Paranormal Fiction, M/M Romance, M/M Supernatural Fiction and tagged A Dreamspun Beyond Title from Dreamspinner Press, An Alisa Highly Recommended Story, An Alisa Release Day Review: Ghost of a Chance (Requiem Inc. #1) by Kris T. Bethke, author Kris T. Bethke, Ghost of a Chance (Requiem Inc. #1) by Kris T. Bethke, Requiem Inc series by Kris T. Bethke.